It’s a wonderful Sunday Morning in Mid October…the air is crisp and cool…life is good. 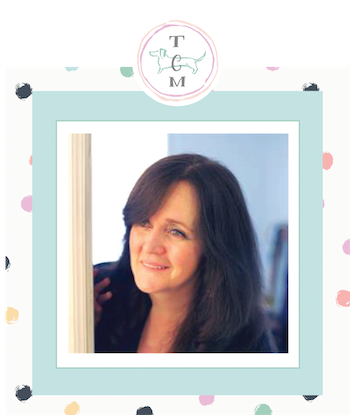 It is about to get even better because I have a wonderful home tour for you today…filled with cottage fresh and fabulous home decor! What is even more special about this home is that the loving roof covers 4 generations and personally…I can’t think of anything more wonderful. Just imagine the memories that are being made in this loving home. 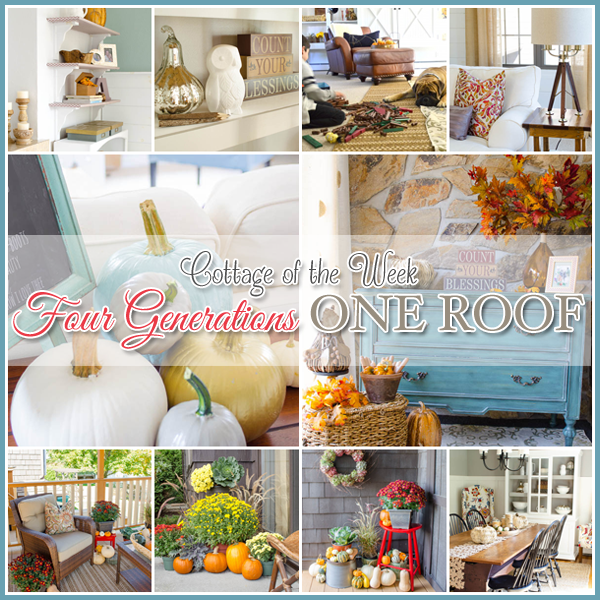 Today we are shining the Cottage of the Week spotlight on Four Generations One Roof. Jess, her husband and son moved into her parents home in 2008…just a short stop while they looked for a home…well never did leave and all I can say is that the rest is history. 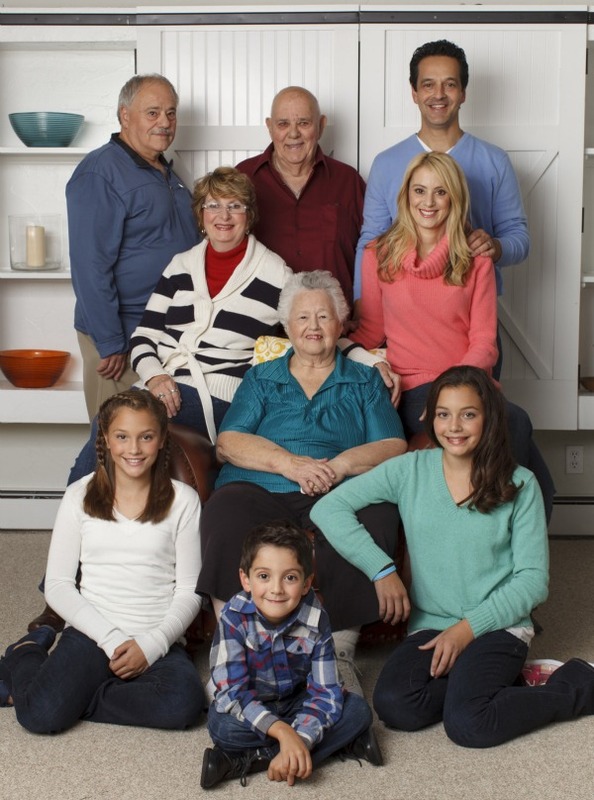 The family compound is now a loving home for Jess and Family, her parents and grandparents! WOW…a series of books almost writes themselves with this scenario! You can read all about this incredible and amazing family and I so suggest you do…it has much heart. 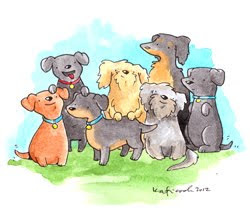 Without further ado…Meet the Family!!! That’s Jess in the coral sweater! Aren’t they a great looking group! I LOVE IT!!! A BIG Fall Welcome from the whole Family! 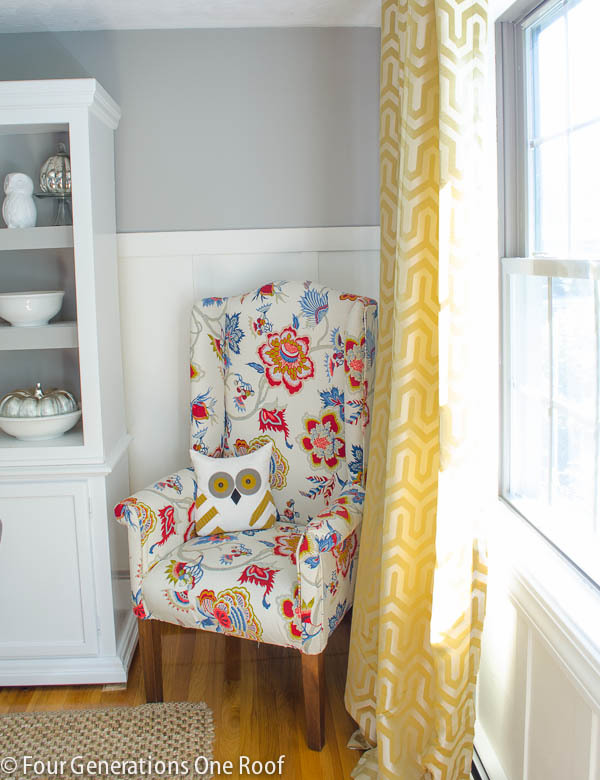 Step into the foyer…I love this space…it is bright…airy…cheerful and so Cottage Fresh. 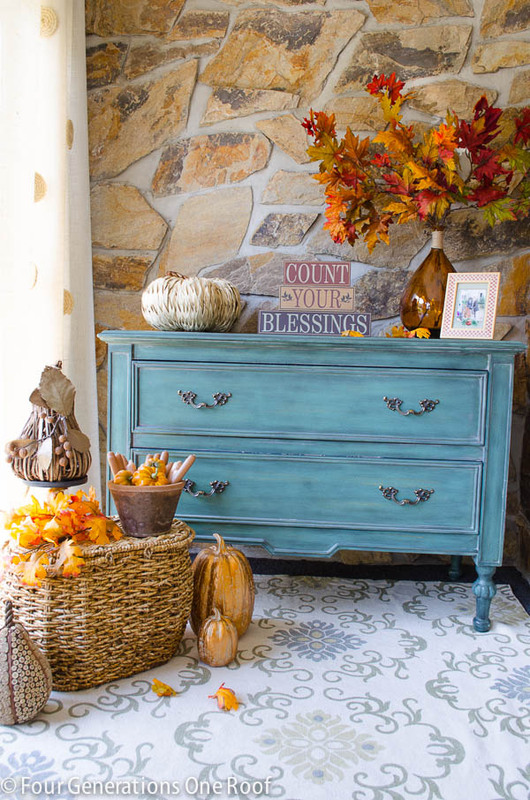 The dresser is to die for. 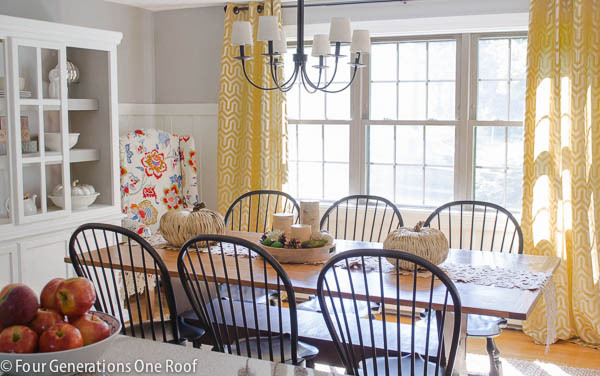 There are a few family rooms in the home…but this is Jess and her immediate families space and may I say it is wonderful. I just love the light an airy feeling you are surrounded by. 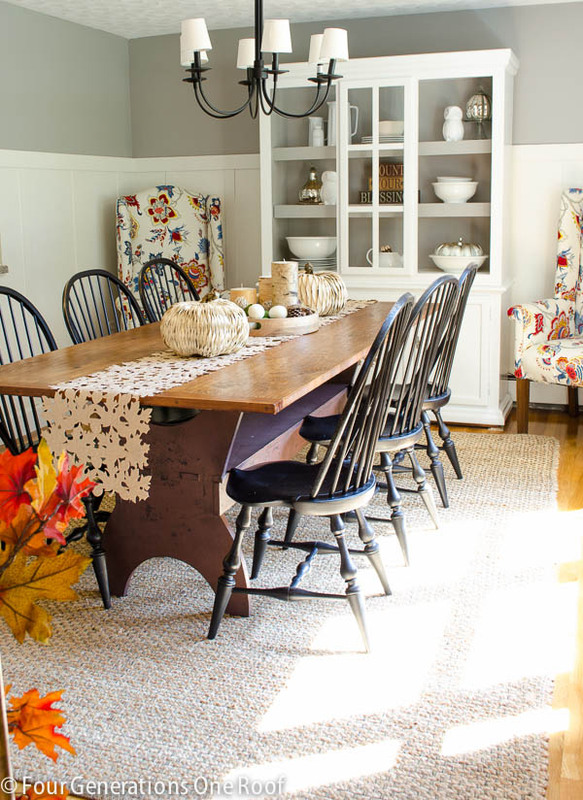 There is so much attention to detail throughout this great gathering space…as you can see Jessica has a decorators eye. Every hue immaculately blends. 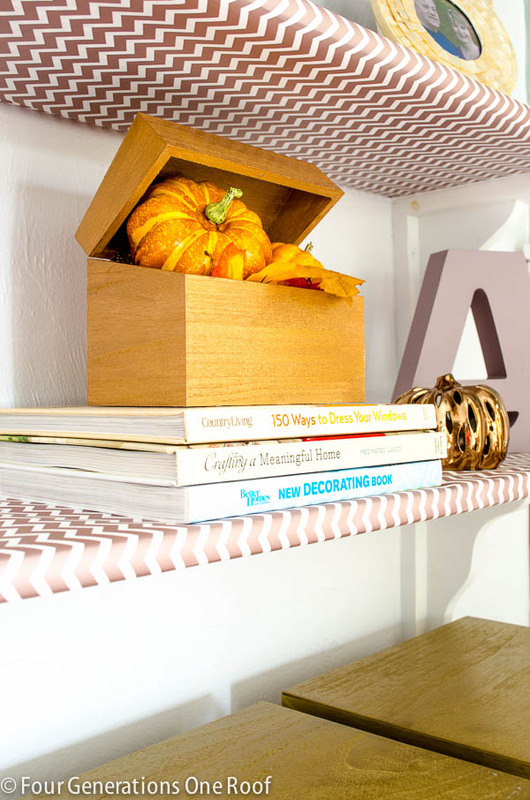 let’s take a closer look at those fabulous shelves…Jessica wrapped them in chevron stripes and they are simply spectacular! 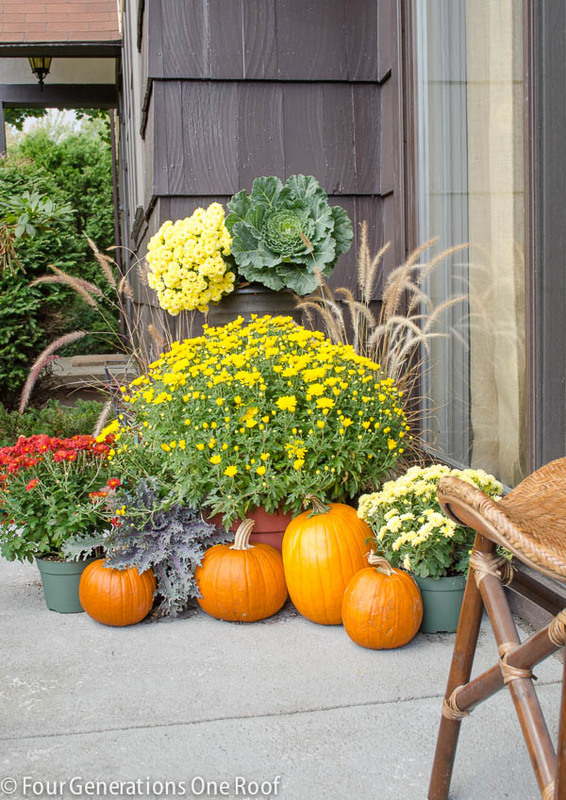 Touches of Fall are everywhere. 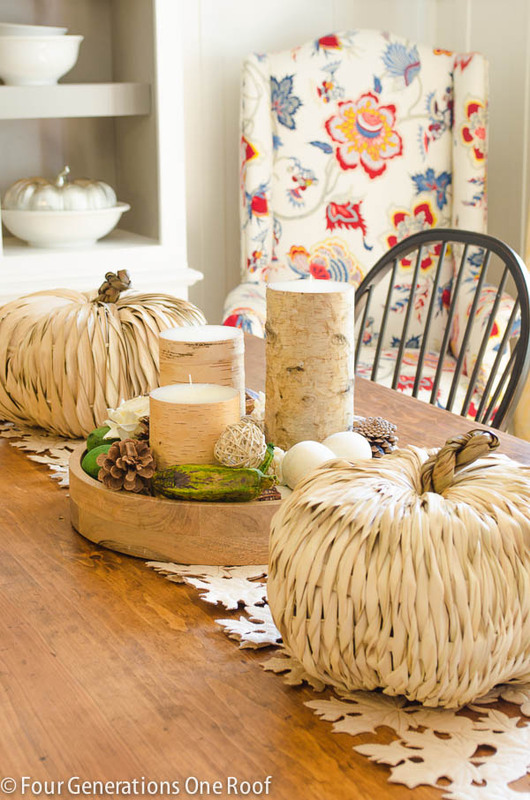 This multi-purpose room also has an office space…and as you can see that Jess has decorated it with gourds in the perfect shaded baskets. Gourds are her choice because they offer a lot of decorating pizzaz for a small price tag. 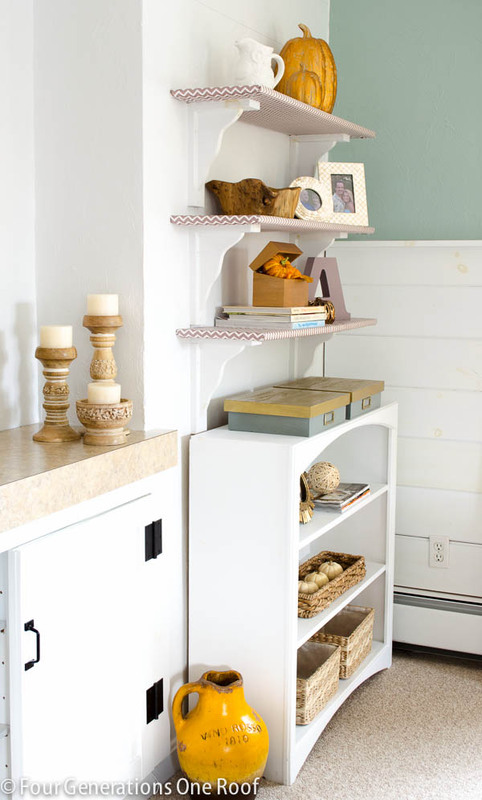 I know you have probably fallen in love with this built-in…I have…and guess what…you can get the DIY here! All and all this family room is perfectly named but it should also carry the tag of WONDER room!!! Drop by…there is just so much more to see. The kitchen is FRESH!!!! 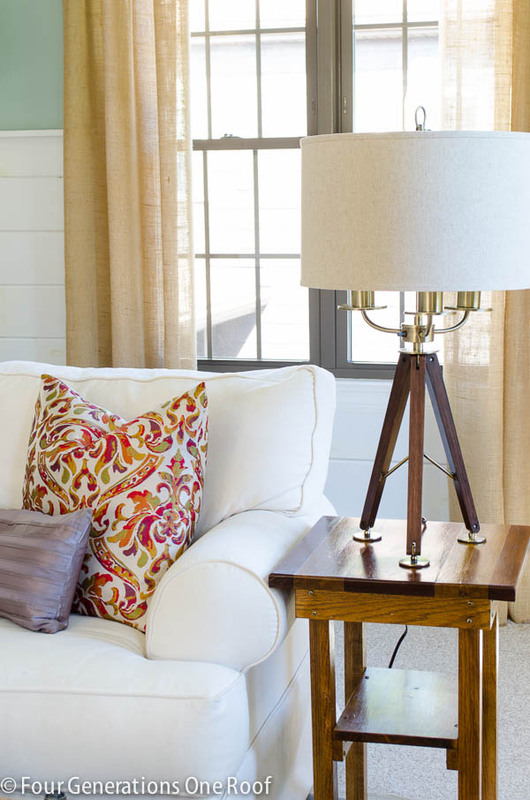 Just like an ocean breeze…you can feel the coastal influence throughout the home and I think it is wonderful. 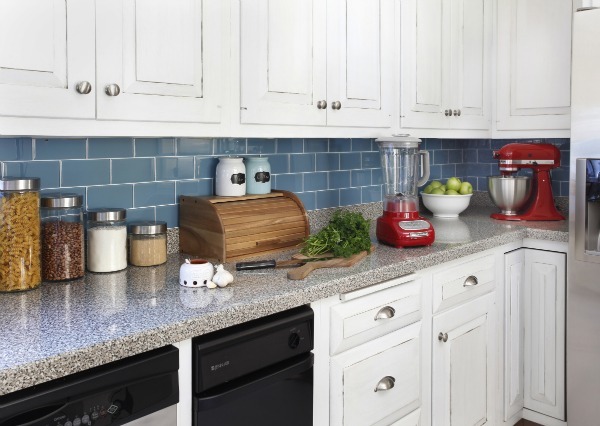 Gorgeous counter top and all the right accessories! I love the POP of Red! 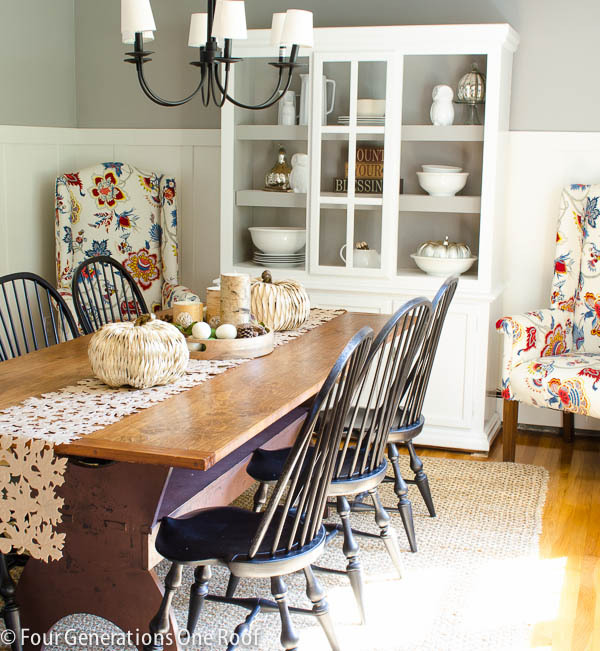 Now this charming dining room graced the pages of Woman’s Day and there is no question why…it is a breath of fresh air! 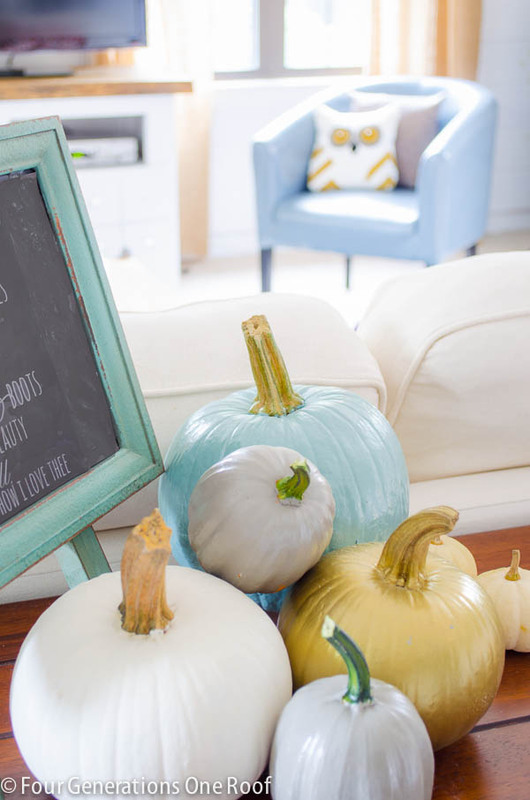 Autumn Decor never looked so fabulous! Jessica is so detailed oriented…every space is tended to in a loving manner. Little touchs of the families whimsical personality comes through ever so gently…this little guy makes me smile..how about you or should I say WHOOOO! The perfect setting for a family meal. Oh yes…the room has a view! 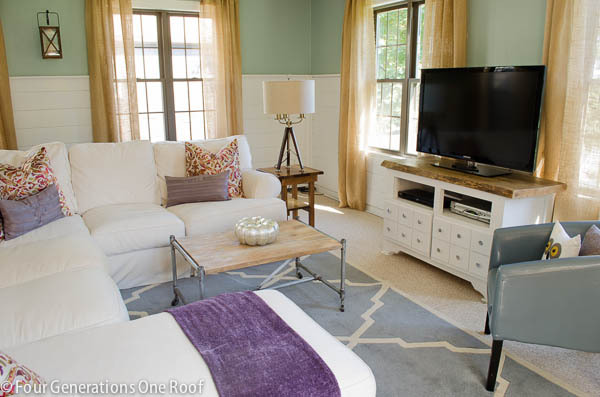 Jessica wanted this room to blend with the family room and she sure accomplished that flawlessly. All of the special touches are amazing. 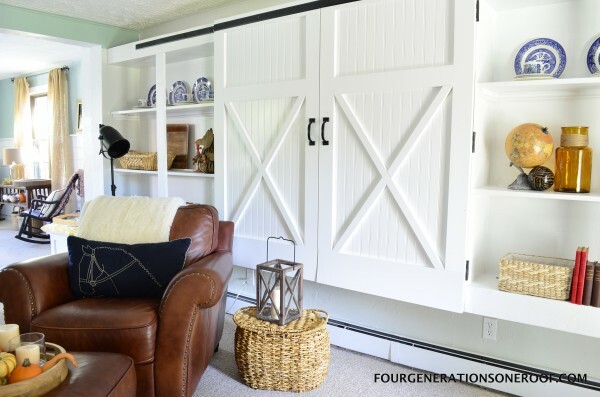 Check out the gorgeous barn doors that her father madethis room. They are spectacular. There are details throughout this entire are…each one more creative than the other! Gorgeous storage space and look at that fabulous cornice above the window. 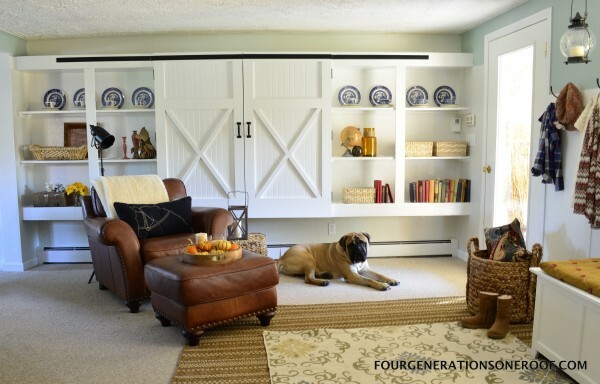 There is so much to see and learn from this room…so make sure to visit this space when you come over for a cup of coffee and by the way…this room is “Garth” approved! See how much he is enjoying the sunlight beaming in! 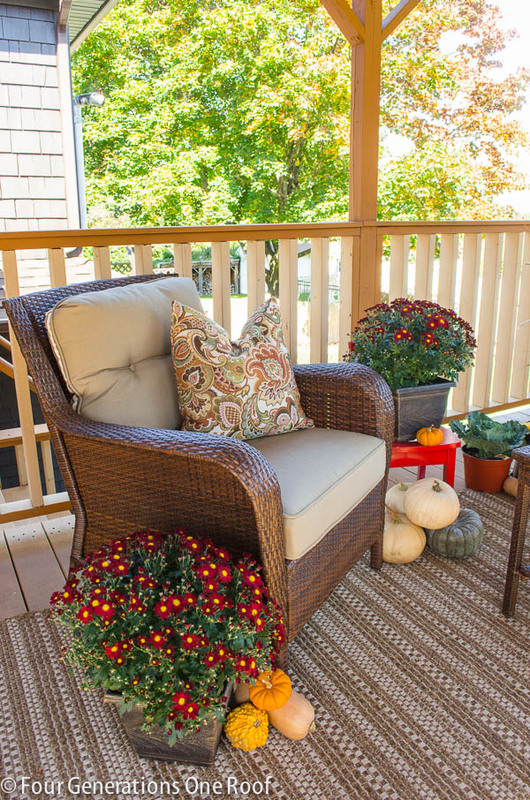 Jessica and her whole family are inviting everyone to come by…sit for a bit on the porch and check out all of the other fabulousness on this wonderful blog. I bet your furry friend would love one of these! 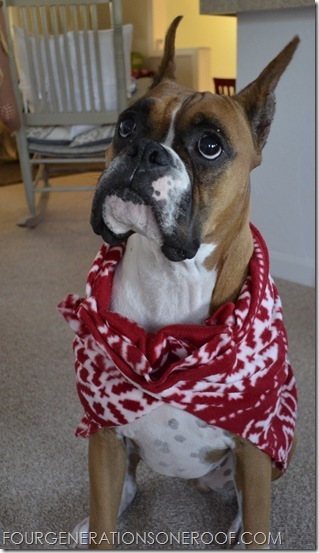 Shelby shows you have fab your furbaby can look and stay warm and comfy!!! Is she precious or what! 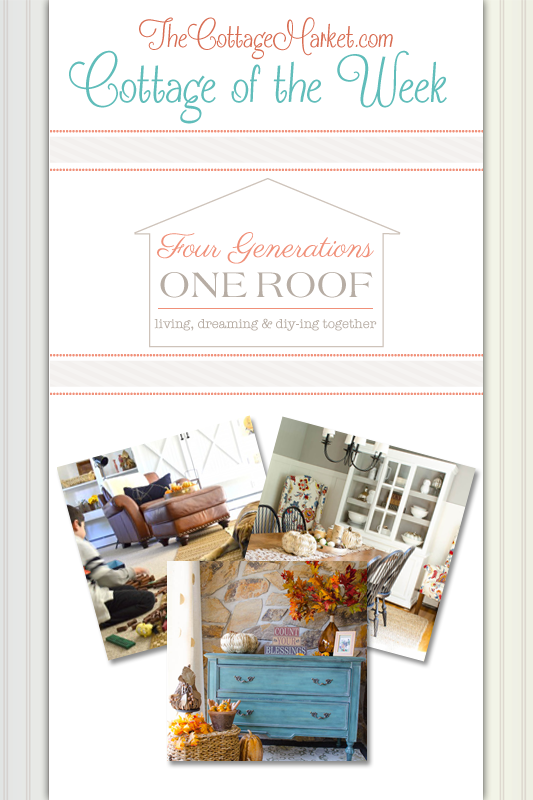 So as you can see…there is a vast array of fun waiting for you at Four Generations One Roof! Everyone here at The Cottage Market would love to thank Jessica and her whole family for inviting us into their loving home today. They were incredibly gracious hosts. I know that I for one have been inspired while having my heart warmed in the process! Thank you so much for having us over! Don’t forget to check out all of our other Cottages of the Week…tons of goodness waiting for you! 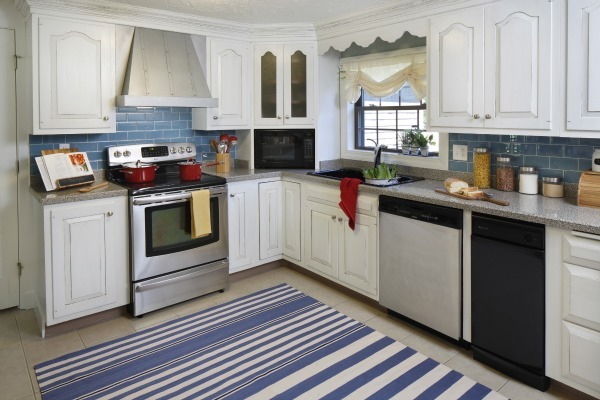 If you still want some more Home Tour Fun…Check out the Cottage of the Week Gallery! Thanks so much Andrea for sharing my family with your readers 🙂 Have a great day! 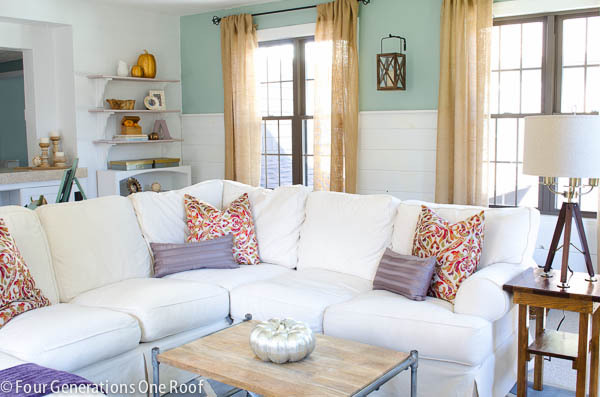 Jessica’s homes is so fresh and clean and inspiring! I just adore her style … and her story! Thanks as always for some excellent Sunday morning eye candy!